6.1 oz. 100% preshrunk cotton. Ash is 99% cotton, 1% polyester. Light Steel is 90% cotton, 10% polyester. Safety Green and Safety Orange are 60% cotton, 40% polyester. Tag-free neck label for ultimate comfort. Double-needle coverseamed neck. Taped shoulder-to-shoulder with ribbed knit cuffs. Five-point left-chest pocket. 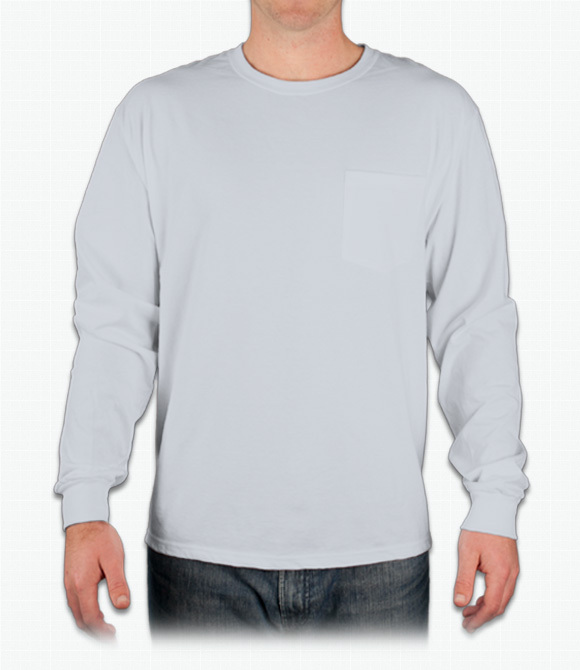 All the comfort and style of the regular Hanes long-sleeve T-shirt with the semi-formal touch of a front pocket. "I wanted the front text to be printed on the pocket, which it wasn't, which no one told me that it would be in a different place than my design. " "It should be noted that these are a bit rectangular and wide--put it in whatever terms you can haha...they aren't bad, but they aren't form fitting and possibly for some people they should go a size down if they want a more svelte look and not a "baggy" (-ish) look. But it's fine in quality...what I expect from Hanes. "